The MMA team dominated the George C. Previll Memorial Inaugural Inter-Academy Monomoy Challenge. As crew members of the MMA rowing teams stood facing the waterfront of SUNY Maritime College, the scene couldn’t have been more different from the one they left behind in Castine. To the west, the towering skyline of New York City. In the water, teams from SUNY, Massachusetts Maritime, U.S. Coast Guard, and U.S. Merchant Marine academies, practicing for races about to commence, coxswains shouting to their crews to quicken the pace. The two MMA teams were all MUGs (Midshipmen Under Guidance), some of whom had never rowed before just two weeks earlier when they began training for the George C. Previll Memorial Inaugural Inter-Academy Monomoy Challenge. There was one unspoken question in each of their minds. Lifeboat races between maritime academies were common in the 1950s and ’60s. But in recent years, none had been held, with the exception of an annual competition between Kings Point and SUNY Maritime, sponsored by the Marine Society of the City of New York. Members of the Society resolved to bring back the inter-academy races this year. The task of organizing and training MMA teams was given to Lieutenants Lonnie Christian and Kyle Willette, company officers for the regiment who put out the call for “motivated MUGs” to volunteer on Day 5 of RPT (regimental preparatory training). 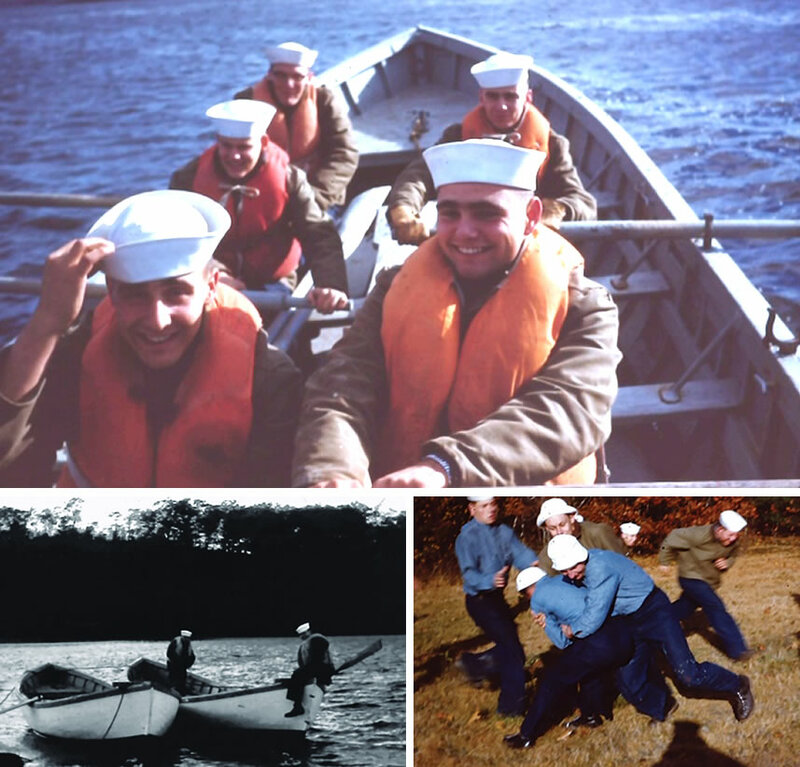 Lifeboat handling is a normal part of preparatory training: learning how to row and work as a team and following commands, which are described in The Maine Brace. 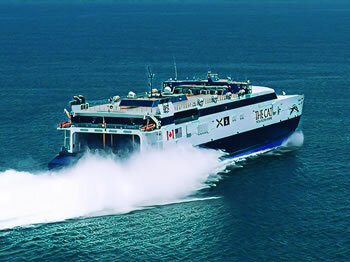 “For many, it’s their first exposure to being on the water and on a boat with other crew members,” says Willette. Everyone was encouraged to make suggestions, and those with more experience, such as Kailyn Russell, a marine transportation operations major who had worked as a deck hand on the schooner Margaret Todd in Bar Harbor, had ideas. Company officers, Lieutenants Lonnie Christian and Kyle Willette led—and inspired—the teams. Forming relationships, learning from one another, problem-solving, developing communication skills, and watching leadership emerge were just some of the benefits that came from the two weeks of practice on the waterfront. On the nine-hour bus ride from Castine to New York, the 28-member crew, of which 15 would compete as two boat crews and seamanship team, went over their strategy. The seamanship part of the competition would involve a timed rescue that required rowing to and retrieving a five-gallon bucket, which represented a man overboard; heaving one line for distance and another for accuracy; and a knot-tying relay. The relay would demand each person in a six-member team tie a specified knot in turn for speed and correctness. This had not been thoroughly practiced in the run-up to the race, so as the bus rumbled south, the relay team worked on perfecting their bowlines, half-hitches, figure-eights and others with determination, challenged by occasional bumps in the road. The story behind the victory. Saturday morning’s events commenced with open practice with Monomoy boats and oars provided by SUNY Maritime. As soon as they were on the water, the two MMA crews discovered the boats were lighter than those in Castine, and the oars were solid Shaw & Tenney ash that seemed to provide more direct transfer of power versus the carbon fiber ones they had been using. “We noticed some of the other teams rowing, and they weren’t in sync the way we were,” says coxswain George Stamatopoulos, a marine transportation and operations major. 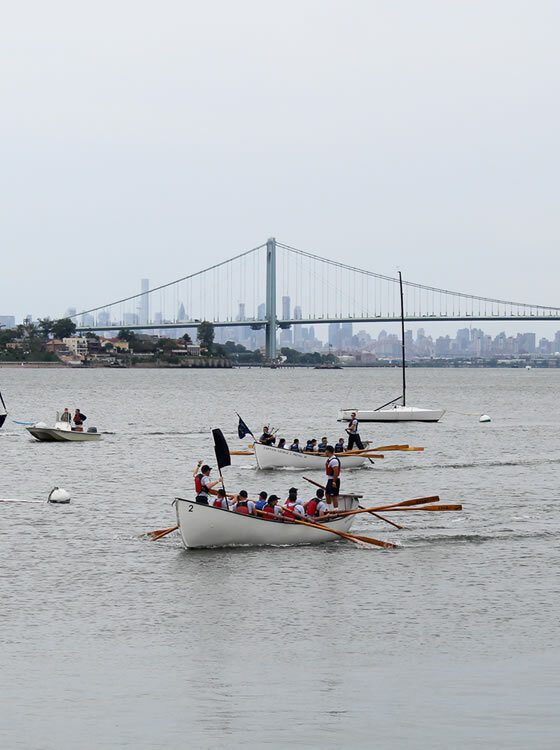 After the annual rowing race of USMMA versus SUNY Maritime, won by SUNY, the main event began with a series of round-robin elimination races that had one boat from each academy running against another along parallel courses. MMA’s 10-member crew rowed to the start against Massachusetts Maritime and paused. 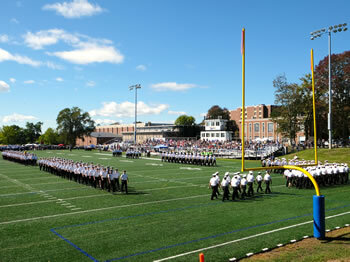 The next two boats facing MMA from the Coast Guard and Merchant Marine academies were also handily defeated, but in the heat against SUNY Maritime, the Mariners were defeated by a half-boat length. Getting it right on the water with intense practice yielded high-fives and a “most impressive” victory. For the last round against SUNY, which crewed its boat with upperclassmen, MMA won the coin toss and chose the outside lane, where they had performed best earlier. The course was one-third of a mile straight to and around a buoy and back, adjacent to the SUNY training ship, with vessels of all makes and sizes traversing the channel just beyond the course. When the start sounded, coxswain Stamatopoulos’ commands, “Stroke…stroke…stroke…” increased in tempo, and the boat pulled slightly ahead. Approaching the buoy for the turn back to the finish, Stamatopoulos leaned all of his body into the steering oar and initiated the turn. The starboard side rowers held their blades steady in the water, acting as a brake, while those on the port side applied all the torque they could muster, spinning the boat around the buoy and gaining yet more advantage on their opponents. Perhaps sensing defeat or suffering fatigue, SUNY continued to fall behind as the MMA crew became focused on the finish and pulled away by more than a dozen boat lengths. The win gave MMA a morale boost in the ensuing seamanship competition. First came the line heave for accuracy, where MMA missed out on gaining points. But then came the line heave for distance, where MMA took second place. Next, six members of the crew stood side by side in the knot-tying relay, and 1-2-3-4-5-6, they won. Finally, the crew rowed some 200 meters to retrieve the “man overboard” bucket in the fastest time, which they won in spite of sizable wakes rolling in from the nearby ship channel. The combined rowing and seamanship wins gave MMA a stunning victory, the George C. Previll Memorial Challenge plaque and $4,000 to be used for the regimental scholarship fund. The competition and victory created their own rolling wake. Six members of the crew stood side by side in the knot-tying relay and 1-2-3-4-5-6, they won. Gandy notes, “While Lieutenants Willette and Christian were instrumental in overseeing the effort, the important thing is to recognize what this group of freshmen did, and that’s huge for us as a small school and small regiment to have that…call it bravado. “The students did a lot of problem-solving, determining how to be effective, and took initiative. The unspoken question everyone had before the competition: Can we compete and do ourselves and the academy proud? 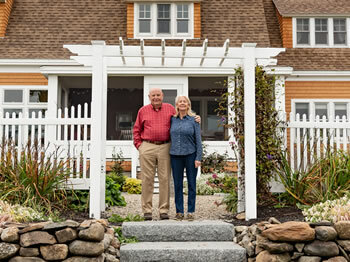 The Monomoy boat’s roots date back to boats used in the whaling industry and surfboats used by the U.S. Lifesaving Service, one of which was known as the Monomoy, designed for use in the high surf off Monomoy Island and Chatham, Massachusetts, according to this year’s race program brochure. In 1934, the U.S. Coast Guard standardized the design for contract purposes, and thousands were built for use as lifeboats and gigs aboard naval and military ships, commercial freighters, and ocean liners. The standard Monomoy was 26 feet long, with a seven-foot beam. In the 1950s and ’60s, Monomoy races between maritime academies were common. But subsequently, the races became fewer, and in recent years, none have been held. Says Wade, “I am happy to say I voted for the Portland Marine Society to be a sponsor for this year’s race,” which was presented by The Marine Society of the City of New York, whose partner sponsors included the Boston Marine Society and Portland Marine Society. Among the shoreside supporters of the race was Capt. Robert “Bob” Pouch ’62, NYNM/USNR (Ret. ), who entertained the MMA cadets with tales of when he and classmates were MUGs. They sometimes rowed to Smith Cove across from the Castine waterfront, where they were out of sight of their strykers and relaxed and played touch football. “Not a single day passes by without special memories of my days at MMA,” says Pouch, who has been an integral part of the New York Harbor administration and activities for many years. A few pictures depicting the long history of Monomoy boats at MMA. I think you may find this article interesting - "Rowing with Heart"
Homecoming: It’s PersonalWe reconnect and celebrate. One alumnus hopes to inspire students for the future.